Heart racing and fists shaking, I stood ready to fight. I was moments away from sparring with the top student in my karate class in Japan: a fast, coordinated monster who had defeated all challengers. But nanoseconds before the fight began, something shifted. Nervous anticipation disappeared and I snapped into total focus. The room, the other students, and everything else faded into irrelevance, leaving my awareness filled only with my opponent in his white gi. When the coach shouted, “Go!,” my body shot through the air like a lightning bolt, my fist connecting to my opponent’s ribs. Somehow I had scored a point against the best in the class, but paradoxically I didn’t care. All that mattered in that moment was that timeless flash when there was no sense of self, no me, just a body effortlessly flying through space toward the inevitable goal. That moment of flow remains one of the most powerful and beautiful things I have ever experienced. Which is why, 25 years later, I find myself sitting in a tight blue cap with a 120 electrical leads wired to my head, while four scientists of the Therapeutic Neuroscience Lab scurry around me tweaking knobs, rattling keyboards, and testing gear. The clues these scientists hope to uncover are small steps in a massive project that could forever change the way we cure addiction, treat anxiety and depression, and even teach meditation—eventually making the flow state easily available to everyone, with potentially world-changing ramifications for the human race. 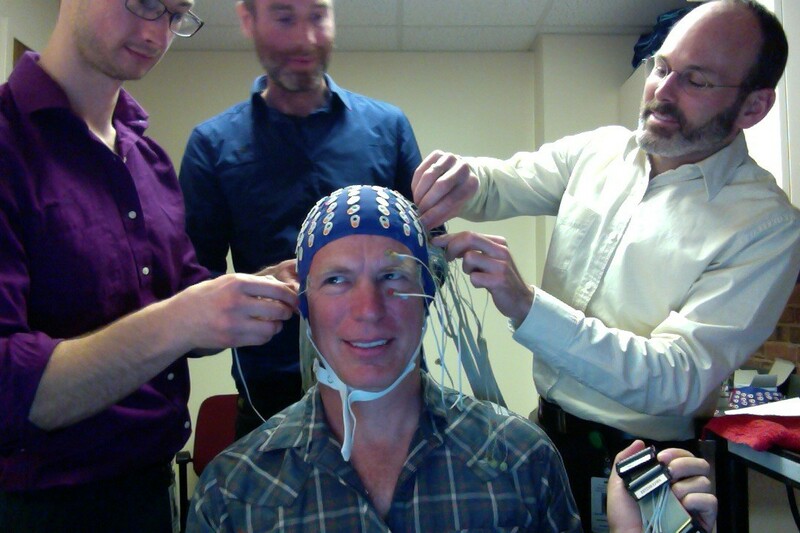 I’m playing the role of lab rat in a groundbreaking test intended to teach us how to find that same state of flow on callusing real time EEG brain scanning, state of the art signal processing, and theories from psychology, neuroscience, and Eastern religion. Those are the stakes, but getting there won’t be easy. “Flow” means to be fully absorbed in an activity to the point of losing yourself in the joy that comes with doing it. Though it was first clinically defined by Czech psychologist Mihaly Csikszentmihalyi (Chik-zent-mee-hi) in the 1970s, we have known about the flow state for millennia. There is a wealth of colloquial terms we use to talk about flow: being in the zone, on a roll, in the moment, in a groove, in tune, on fire, centered, in the now. Flow feels good—smooth, masterful, concentrated calm—and at its peak, it can be intensely pleasurable. Flow is also associated with the highest levels of human functioning and achievement. Top athletes and musicians, and even hackers, stockbrokers, and poker players all report taking advantage of this condition of peak performance, focus, and clarity. So why can’t we be in a flow state all the time? I learned the painful answer to this question during the months of clobberings that followed that one magical day in karate class. I had done so well in that bout that now the teacher and other students expected me to perform at that level every time, never mind that I expected it of myself. The pressure was on, but something was wrong. It seemed like no matter what I did, I just couldn’t get back to that state of flow. Instead, I was over thinking every move, second-guessing all my instincts, and found myself utterly unable to perform. It totally sucked: a classic experience of choking. The reason that we can’t get into flow is because we get in our own way. Getting in our own way, it turns out, is the condition of most people most of the time. A 2010 study by Harvard’s Matthew Killingsworth and Daniel Gilbert sent participants text messages at random times throughout the day, asking them what they were doing and whether they were thinking about that activity or something else. In a sample of over 2000 participants, the researchers found that people were daydreaming almost 50 percent of the time. Daydreaming is the opposite of flow. In daydreaming—or “mind wandering,” as psychologists so aptly call it—we’re caught up in our fantasies, self-reflection, fears and desires. In a flow state, on the other hand, we’re totally focused on just the present moment. We daydream so much that scientists call it the default mode—what the human brain is doing when it’s not focused on something in particular. The brain network responsible for daydreaming is named the “default mode network” (DMN). And much like letting your car idle will burn your fuel reserves, this “idling” activity negatively affects our daily happiness. The Harvard study, for example, discovered that people were the least happy when daydreaming. As Killingsworth summed it up, “A wandering mind is an unhappy mind.” Simply put, it feels good to be focused on the moment in a flow state and bad to be fantasizing about greener pastures, or the purple vistas of what might have been. In extreme cases, this mental fantasizing can turn into rumination and recrimination, so it’s not surprising that DMN activity is significantly correlated with depression, anxiety, and other psychiatric disorders. It can also be dangerous. A recent study by the National Highway Traffic Safety Administration found that daydreaming causes twice as many fatal crashes as texting. Of all the aspects of the DMN, however, the most compelling and medically significant may be its connection with addiction. Could heroin junkies one day use flow to overcome their addiction? Judson Brewer, an MD-PhD who until recently ran an experimental addiction clinic at Yale, thinks so. Now in charge of the Therapeutic Neuroscience Lab at the UMass Medical Center, Brewer is a small, bearded man with a balding head and intense eyes behind wire-rimmed circular glasses. He is one of an elite cadre of neuroscientists attempting to find radical new medical interventions through the understanding of how the brain functions during the flow state. Brewer’s research centers on a region of the brain known as the posterior cingulate cortex (PCC), which is a major node in the DMN. The PCC is one of the most active and densely connected areas of the brain, involved in emotion and memory processing. It also turns out to be very good at interfering with the flow state. In a 2013 paper published in the Frontiers of Human Neuroscience, Brewer noted that the PCC gears up when we are daydreaming and are caught up in DMN activity. When the PCC calms down, on the other hand, we become more mindful of our immediate experience, making it easier to enter a flow state. But here’s the real clincher. Numerous studies have linked PCC activity to the sensation of craving and have demonstrated the role it plays in addiction. That is, daydreaming and addiction are linked. In fact, addicts who develop lesions in the PCC (thus rendering it ineffective) report an immediate loss of craving and addiction. Brewer noticed this correlation and wondered whether it might be possible to craft an intervention based on these findings. If he could teach addicts to voluntarily dial down activity in the PCC, would that give them a leg up in overcoming their addiction? The answer from his experimental trials is a clear yes. The intervention Brewer found to deactivate the PCC was mindfulness meditation. Mindfulness, which simply involves bringing one’s awareness to the sensations of his or her present-moment experience, seems like a natural way to bring us out of the mind wandering state. The whole point is to ”be here now,” as the saying goes, and Brewer had a hunch that doing just that might be able to reduce PCC activity in the brain. Brewer’s personal interest in mindfulness meditation began decades ago with a horrible breakup. In his early twenties, he thought his life was all set—he had just graduated from Princeton and was engaged to be married to his college sweetheart. But just before beginning medical school, his relationship fell apart. Upset and unable to sleep, Brewer started listening to Jon Kabat-Zinn’s mindfulness meditation instruction tapes and found that they helped him do more than just pass the time. The training in concentration and relaxation he received helped him make it through his breakup, and subsequently get through medical school. After that, Brewer was hooked. Investigating this question wouldn’t be easy, but the difficulty of the challenge was matched by the enormity of its possible benefits. After some promising initial results with cocaine and alcohol dependence, in 2009 Brewer created an experiment at Yale’s Therapeutic Neuroscience Clinic using mindfulness practice to treat smoking addiction. Since nicotine is harder to kick than even heroin, smokers made great guinea pigs. The study pitted the American Lung Association’s Freedom from Smoking program—the current gold standard in smoking cessation treatments—against simple mindfulness practice in a population of 88 smokers. After four weeks, only 15 percent of the FFS smokers had quit, versus 36 percent of the meditators. Mindfulness appeared to be twice as effective. After 17 weeks, the FFS group had dropped to six percent, while the meditators stayed at 31 percent. Clearly, Brewer is onto something when it comes to using flow to treat addiction and other conditions. But in following this thread, things go much further, and get much weirder, than that. Csikszentmihalyi’s classic definition of the flow state includes the possibility of a loss of reflective self-consciousness. The more involved you are in an activity, the more it feels like the activity is sort of doing itself, and “you” disappear into the easy bliss of flow. As you might guess, the pleasurable loss of self that comes with flow hasn’t gone unnoticed. Buddhism, Taoism, and Hinduism have traditionally put a lot of emphasis on the flow state, referring to it with phrases like “doing without doing,” “becoming one with things,” and “no-self.” The main way to get into the flow state, according to these traditions, is the practice of meditation. As a practicing Buddhist, the idea that the experience of no-self could be linked to the flow state was irresistible to Brewer. Brewer since has proven that this loss of reflective self-consciousness actually occurs in the flow state. In a study, he asked 12 long-term meditators to engage in three different types of meditation while in an fMRI scanner. What Brewer found surprised him: meditation didn’t seem to activate any particular region of the brain, but it clearly deactivated the PCC. Other researchers, such as Guiseppi Pagnoni and Veronique Taylor, have found very similar results in separate studies: long-term meditators were dialing down the activity of the PCC much more than normal subjects. While there is no single “self spot” in the brain, the PCC appears to be a vital node in the network that generates a sense of self. In other words, the more PCC activity, the more ego is happening in the moment. Having found the fMRI signature associated with experiencing a strong sense of self, Brewer became interested in making this feedback easily available—both for addiction cessation and for meditation instruction. However, fMRI is costly, uncomfortable, and hard to pack up and move about, so it was a non-starter for a meditation app. Electroencephalography (EEG), on the other hand, is cheap, portable, and easy to use. 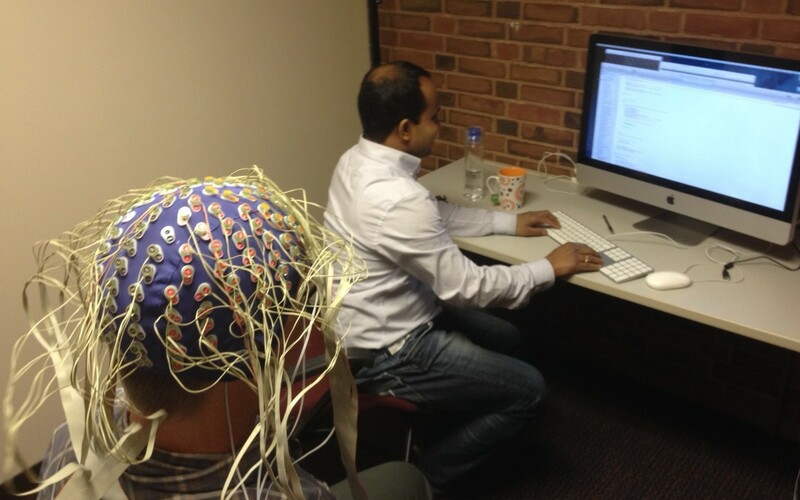 Could EEG be used to detect the relative activation of the PCC? Brewer’s team at the TNL is working to find out by isolating a useable EEG signal of the PCC, and they seem to be getting somewhere with it. As a longtime meditator with over 10,000 hours of practice under my belt (and an amateur neuroscience fanatic), I’m fascinated by the search for the neural correlates of meditative states. Over the past ten years I’ve met an unlikely hodgepodge of philosophers, doctors, Buddhist monks, and lab geeks all attempting to hunt down the verifiable traces of deep meditative states in the brain. I thought I had seen it all, but when I learned what Brewer was doing, I realized he was onto something unique and incredibly important—a practical way to train people into the no-self state. I jumped at the chance to visit his lab, with no real idea what I was getting myself into. The Therapeutic Neuroscience Lab had all the hallmarks of Silicon-Valley-style entrepreneurship: the tabletops were strewn with electronic gear, computer guts were lying outside the casing, and empty fast food cartons were everywhere. There were stand up desks and huge monitors galore, but almost no art, plants, photographs, or other decorative touches, excluding a hastily taped-up Buddha or two on the walls. Newly empty cardboard boxes were stuffed under every desk, and there were barely any chairs to be found. I was warmly greeted into this Spartan atelier by Dae Houlihan, a young neuroscience grad student newly moved to Massachusetts—just one of the several crack brain-research team members Brewer has assembled to crack the EEG puzzle. He offered me some fine herbal tea, which I eagerly sipped. Brewer, hearing that I hadn’t eaten, opened a Tupperware tub and handed me a peanut butter sandwich, which must have been his own lunch. The team quickly whisked me into one of the test rooms, sat me in a chair, fitted me for a cap, and put it on my head with what seemed like micrometer precision. It all happened so fast that I kept expecting someone to say, “This won’t hurt a bit.” I eyed the hammers, drills, and other power tools lying around nervously. However, the next step wasn’t trepanation, but instead the application of glue, or something that felt like it, to my head. Actually, the substance was electrically-conductive gel, which they squirted with fat syringes (the kind found at hobby stores and usually loaded with epoxy) into each of the 120 holes in the cap. They then attached 120 leads to my head, which ran to their signal processing equipment. We then spent several hours zeroing in on the EEG signal of reduced PCC activity. Their rig was impressive, and afterward I couldn’t help wondering if someday in the near future I would be using an iPhone app based on this technology to deepen my meditation practice. The possible applications of such a portable rig would be immense. Imagine a lightweight headset, something like a pair of headphones, that could plug into your smartphone and feed brainwave data into an app to give you real-time feedback about the amount of self-reflective consciousness (i.e. getting in your own way, non-flow, daydreaming) going on in your brain moment by moment. Because the device would actually measure the activation of the PCC, there would be no guessing about how much of a sense of self was present: it would be clear when the feedback was in the red versus the blue. Will applications like Brewer’s usher in an era of technologically-mediated neurofeedback allowing people on the street to walk around in a deep state of ecstatic absorption centered around their everyday activities? Will doctors and psychologists soon be prescribing a half hour a day with a “flow machine” app to people suffering with everything from alcohol dependency to severe depression? The answer isn’t yet clear, let’s just say that if it does come to pass, I will be first in line. This article originally appeared on Michael W. Taft’s meditation blog Deconstructing Yourself. http://www.ncbi.nlm.nih.gov/pubmed/23422198 is just one example.